ROP is defined as a disorder of the developing retina of low birth weight, preterm infants potentially leading to blindness in a small but significant percentage of those infants. It is thought to be caused by disorganized growth of retinal blood vessels which may result in scarring and retinal detachment. ROP can be mild and may resolve spontaneously, but may lead to blindness in serious cases. Both oxygen toxicity and relative hypoxia can contribute to the development of ROP. This condition is slowly coming to light as a result of rapidly improving standards of neonatal care which makes the survival of such premature children a reality. Normally, vascularization of the retina starts from the optic disc and progresses towards the periphery and in most of the normal neonates its almost complete, However, in preterm infants, the retina is often not fully vascularized and ROP occurs when the development of the retinal vasculature is arrested and then proceeds abnormally. Multiple factors can determine whether the disease progresses, including overall health, birth weight, the stage of ROP at initial diagnosis, and the presence or absence of "plus disease". Supplemental oxygen exposure, while a risk factor, is not the main risk factor for development of this disease. Patients with ROP are at greater risk for strabismus, glaucoma, cataracts and myopia later in life, and should be examined yearly to help prevent and treat these conditions. An expert group of Ophthalmologists in India have formulated guidelines regarding this condition. Dilated fundus examination with an indirect ophthalmoscope using scleral depression is most important in diagnosing ROP. 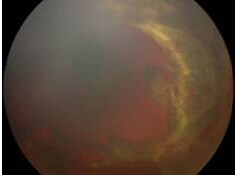 Examination of the retina of a premature infant is performed to determine how far the retinal blood vessels have grown (the zone), and whether or not the vessels are growing flat along the wall of the eye (the stage). Once the vessels have grown into Zone 3 (outermost zone) it is usually safe to discharge the child from further screening for ROP. Whom to screen/examine for ROP? When to screen for ROP? 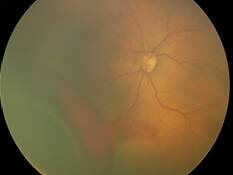 Peripheral retinal ablation is the mainstay of ROP treatment. The treatment of the avascular retina is performed with a solid state laser photocoagulation device, as these are easily portable to the operating room or neonatal ICU. An earlier technique in which regional retinal destruction was done using a probe to freeze the desired areas. However, when laser treatment is available, Cryotherapy is no longer preferred for routine avascular retinal ablation in premature babies, due to the side effects of inflammation and lid swelling. Intravitreal injection of bevacizumab (Avastin) has been reported as a supportive measure in aggressive posterior retinopathy of prematurity. The silicone band (scleral buckle) is placed around the eye. This brings the wall of the eye into contact with the detached retina, allowing the retina to re-attach. Vitrectomy and/or scleral buckling surgery may be considered for severe ROP (stage 4 and 5) for eyes that progress to retinal detachment. Few centers in the world specialize in this surgery, because of its attendant surgical risks and generally poor outcomes.